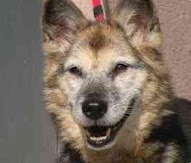 I came across this great article on www.swellpets.co.uk and wanted to share with all of you older dog owners. I've always been told that it's important to get your dog checked out twice a year at the vet. For me at least, the reason for this are obvious: older dogs whose immune systems are compromised can have a harder time bouncing back than their younger counterparts. While that might be part of the story, this article talks about the importance for blood tests for checking with issues with your old dog's organs and dental exams. It's not a large article and it has a lot of good, simple advice, so check it out when you get a chance.